How would you like to own your very own Karina dresses wardrobe? This year, we're celebrating the YearOfYou™. What have you done to reward yourself lately? 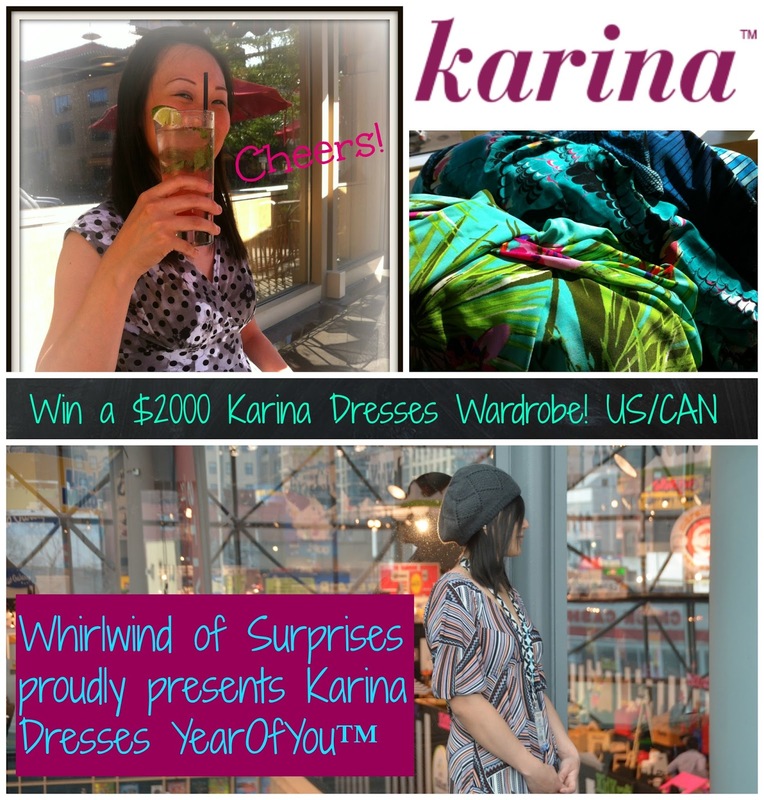 Whirlwind of Surprises is celebrating by hosting a massive giveaway that includes $2000 worth of Karina Dresses of your choice. Karina Dresses offer unique limited edition patterns, machine washable, easy-wear, easy-care dresses that fit women of all shapes and sizes. They make fashion easy and comfortable. Each dress is made with love in Brooklyn, New York. The grand prize consists of 12 Karina Dresses, distributed as one dress per month for 12 months, of the winner's choice. The ONLY mandatory entry is to sign up for the Karina Dresses newsletter so that you can get the latest and greatest deals ands sales. Plus, sneak previews of the newest collections. The winner will be verified to confirm newsletter subscription. My daughters would be in hog heaven if they won this. Both of them are clothes fanatics. I don't know where they got that from because I've never been much for shopping or buying clothes. They are both more of a girly girl than I am. All other entries are optional but of course, the more you do, the more chances you get to win. Who wouldn't want to win such a gorgeous and feminine prize. So, let's get down to the nitty gritty details and get our YearOfYou™ giveaway started! Prize: A year's worth of Karina dresses, 1/month of the winner's choice for 12 months (Value: $2000).